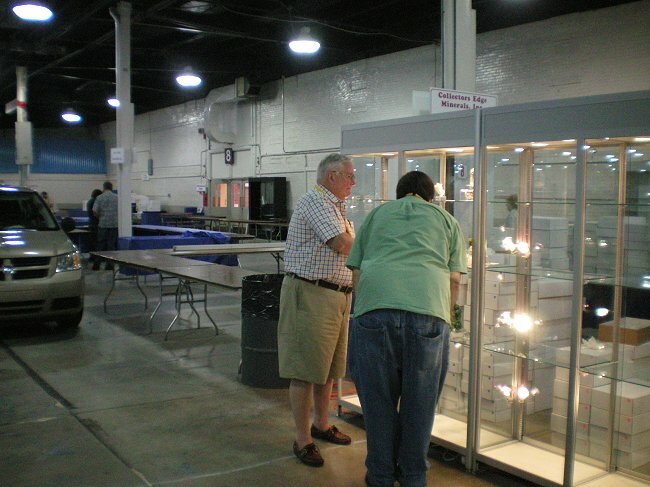 Here's Carter peering into a nearly empty case. 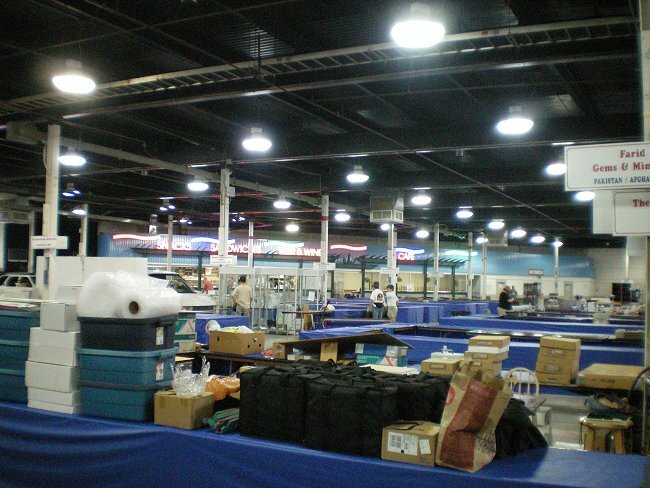 The exposition hall on set up day. This will seem like a broken record but there is not much new of great importance to report on. We are in an era of collection recycling and this was where most of the interest was focused - by me at least. The most interesting and reasonably priced material being offered was pieces from the late Ernie Schlicter collection. Ernie was a fixture here at the East Coast Show for years and we all still miss his good nature. Don and Gloria Olson had hundreds of specimens available from Ernie's collection. I picked up quite a few specimens to post when I get back including a fine Bristol, Connecticut chalcocite and a couple of very fine Loudville, Massachusetts specimens. Here's a photo of Ernie in Don and Gloria's case. 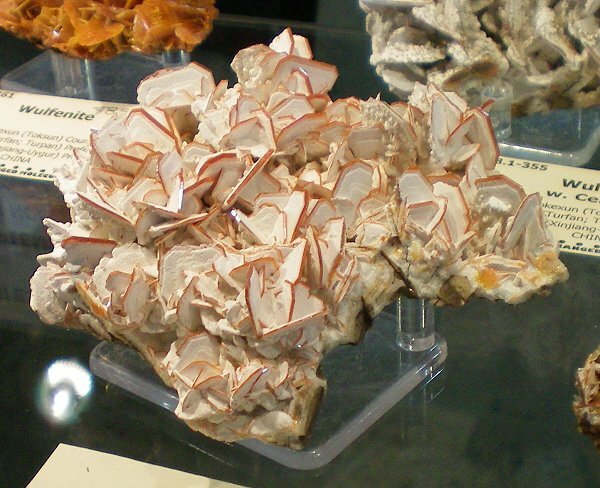 Wulfenite crystals to 6 mm on this specimen from Loudville. 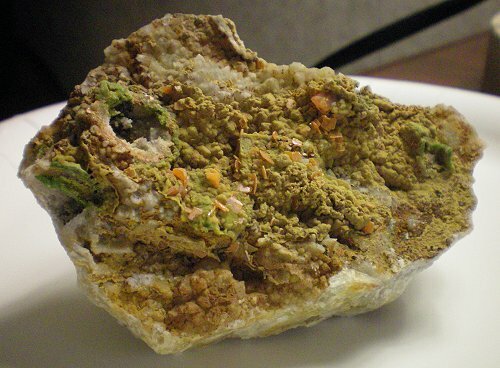 Specimen of pyromorphite and wulfenite from Loudville. A very fine specimen of chalcocite from Bristol, Connecticut. I can always count of Terry and Marissa Szenics to have something interesting on hand and this year was no exception. Terry continues to prep specimens of szenicsite so I picked up several. 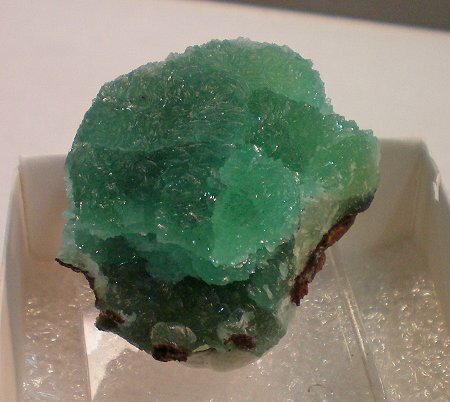 Most have an association of cuprian powellite. He also had some good specimens of the rare mineral hutchinsonite from Quiruvica, La Libertad Dept., Peru. 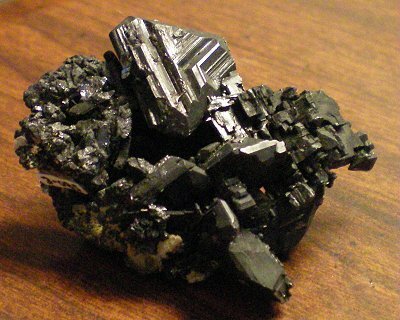 Hutchinsonite is one of just a handful of minerals containing the element thallium. 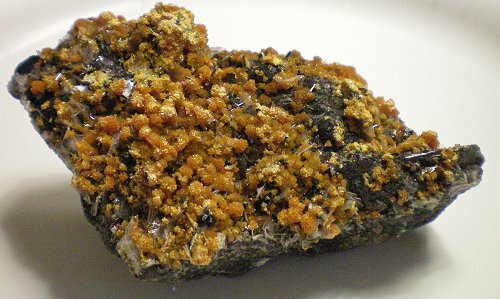 Bladed crystals of hutchinsonite to nearly 1 cm are found with orpiment. 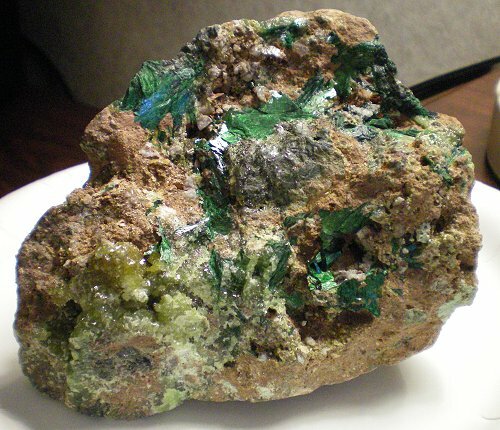 A large cabinet specimen with free standing crystals of pine green szenicsite. Something new to report on was some large crystals of the rare mineral struverite from Tsaratanana, Antananarivo, Madagascar. 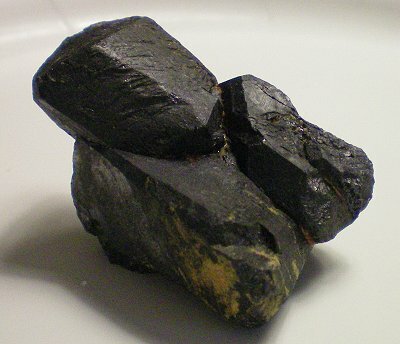 Struverite is a varietal name for tantalum and niobium rich form of rutile. Rutile is a simple oxide of titanium but these specimens have a very high percentage of tantalum - actually more than titanium and a substantial percentage of niobium in the chemical formula. The chemistry is: (Ti,Ta,Fe+++,Nb)O2. This was originally described as a new species in 1907 but the IMA in 2006 ruled that it should be referred to as tantalum rich rutile. Sounds like hair splitting to me and the same logic could be applied to dozens of other minerals. Anyway, these are exceptionally large crystals for the species and Reno, Nevada dealer Scott Werschky had them - 9 in all - and I bought the lot. 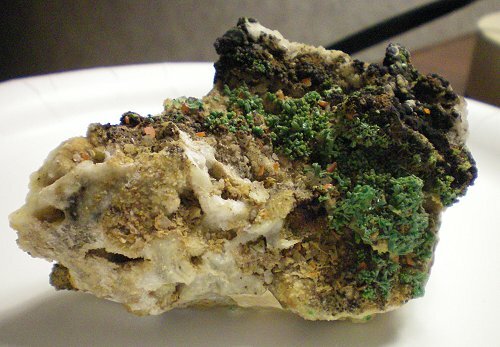 The specimens from this find were first seen at the Sainte Marie aux Mines show and that is where Scott got them. 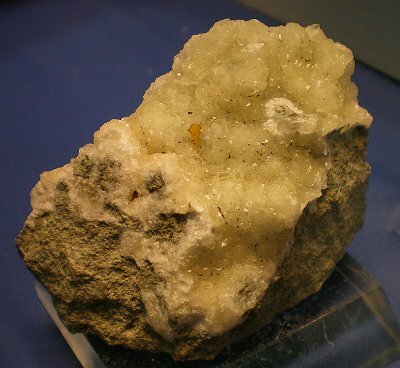 A specimen of struverite with crystals to 2 cm. Another item to report on is some new wulfenite specimens from China. Kevin Downey, of Well Arranged Molecules, had a nice, but expensive, lot of red wulfenite from Tuokexun, Xinjiang, China. This is not a new find but what was interesting was the association with powdery cerussite which creates a nice contrast to the deep red color of the wulfenite. I did not purchase any of these owing to the cost and fragile nature of the specimens but if you're interested Kevin has them. A large cabinet specimen in Kevin's case. Colorado dealer Dudley Blauwet had a new find of greenish blue diopside from Fargon Meeru, Kokcha Valley, Badakhshan, Afghanistan. The crystals are contained in marble and have a rounded habit. I didn't pick any of these up either but I am sure Dudley will have some available at the Denver Show if you're interested. 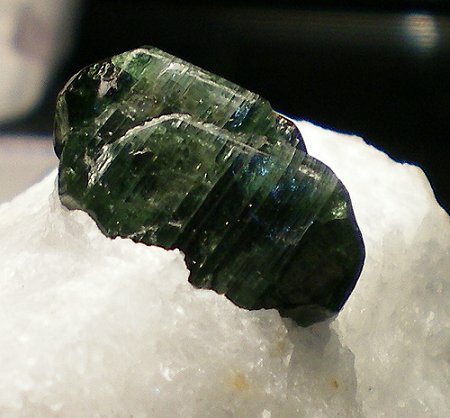 A specimen wth diopside crystals to 1.5 cm. 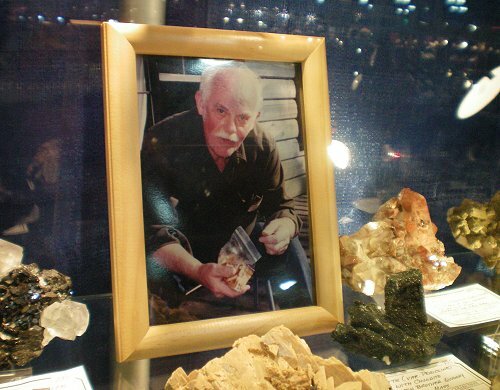 New Jersey dealer Bill Butkowski had a rare specimen of crystallized greenockite from Summit Quarry, Summit, New Jersey. This find was made in the mid 1970s according to Bill. Sharp crystals of greenockite - a cadmium sulfide - are very rare. Bill had this specimen available for $1000. If interested you can find him here - Bill Butkowski . 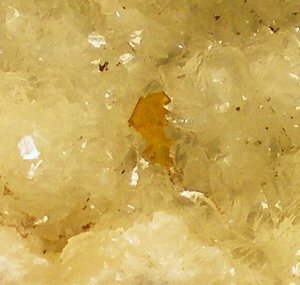 A 3mm crystal of greenockite on heulandite. Brazilian dealer Luiz Menezes had his usual array of fine material from Brazil. He had some new specimens of montebrasite - same material that he had at the West Coast Show - and it was well worth it to pick up several more for future updates. 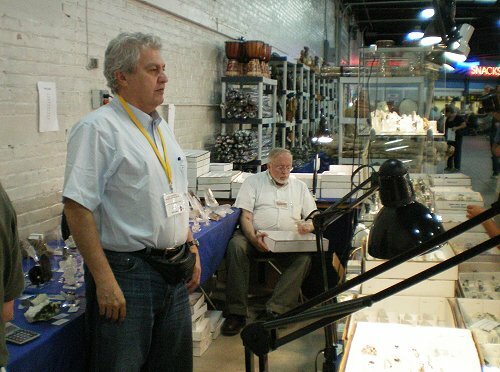 Luiz Menezes (posing for a photo) with mineral legend Bill Pinch in the back ground. Texas dealers John and Maryann Fender had some fine Mexican specimens available. Especially good specimens from the Ojuela Mine. Of particular note were some richly colored specimens of cuprian austinite. John said these came out in the late 1970s based on the newsprint they were wrapped in. I picked up a few and also some other Oujela noteables such as scorodite. 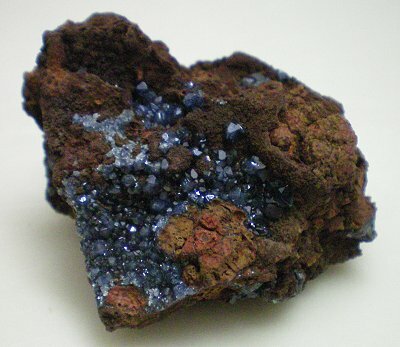 A specimen of cuprian austinite on the left and a richly colored specimen of scorodite with crystals to 4 mm across. As has become customary several of us enjoyed a fine meal at Chef Wayne's Big Mamou. 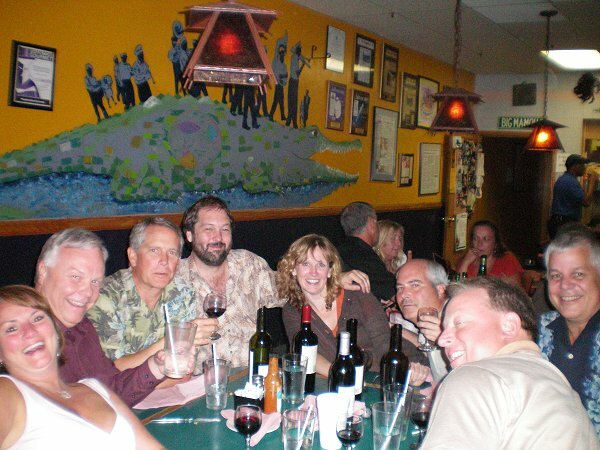 It is one of the finest restaraunts in Springfield with exceptional cajun cuisine. That will do it for me for the 2009 East Coast Show. I will have specimens posted in a week or so after I get back to Weaverville. Many thanks to Marty Zinn and his hard working crew for their efforts to make this another successful show. 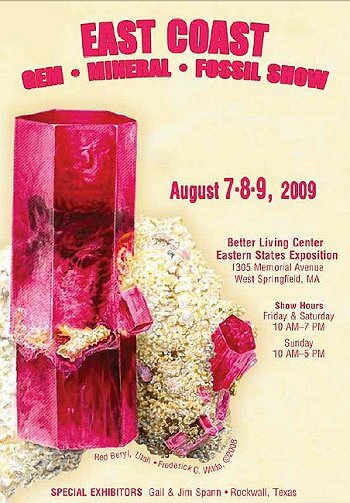 I will be back again next year here in West Springfield, Massachusetts. A large flock of Canadian geese near the entrance to the Eastern States Exposition park. All images, text and stuff on these pages copyright John Veevaert -Trinity Mineral Company 2009 The material on these pages may not be used without permission.